On average, how much time do you spend making dinner for your family? 30 minutes? 45 minutes? Longer? Here’s a budget-friendly recipe that allows you to put dinner on the table in less than 20 minutes. Start to finish. Money-saving tip: Scour your fridge and freezer for pizza toppings. If you have to buy toppings at the grocery store, take a trip around the grocery store salad bar. You can often find delicious ingredients like chopped bacon, blue cheese, Feta cheese, etc., for less than what it would cost to buy these ingredients individually. The best part? Each pizza is customizable. Each family member can choose his or her own toppings, and pickiest of palates will be satiated. I probably don’t need to tell you this, but these pizzas are equally good as an appetizer. Pin this recipe for future reference (Super Bowl, anyone?) Your guests will thank you for the yummy appetizer – and you will thank me for the easy recipe! You can use individual garlic bread pieces, like I did here. Or you can use a frozen loaf of garlic bread. If you're going with the loaf option, simply put all of the toppings on and bake for approximately 15 minutes. Preheat oven to 350F. Place garlic bread slices on a large baking sheet. 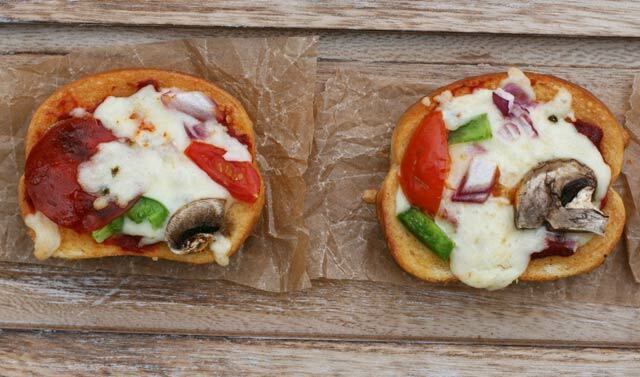 Top each slice with a scant tablespoon of pizza sauce, cheese, and desired toppings. Bake pizzas for 12 to 15 minutes, or until bread is golden brown and cheese is melted. Yum, Yum, Yum. I love Cole Garlic Bread so much. Such a weakness. I could eat a whole loaf with spaghetti easily. Need to watch the calories though! Thanks for the idea. I’m the same way! I haven’t had much success making my own homemade garlic bread that tastes like the frozen stuff.. Maybe I’ll do some experimenting!